Are you currently separated with your military overseas boyfriend, girlfriend, son, daughter, husband, wife etc. and wish you could talk to them more often? Are you wondering how to stay in touch with them? Sometimes all you want to do is pick up the phone and call someone, but not pay an outrageous amount for it. That’s where Vonage comes in. Communication in the military world can be a tricky thing, however modern technology is continually making things easier and easier! Crazy how fast technology changes, isn't it? I'm sure you've seen commercials for Vonage. You know, unlimited long distance calling in the U.S. and to over 60 countries for one low rate. Did you know it worked from the other way too? You can live abroad and still call all those places for one low rate. For those of you who aren't familiar with Vonage it is an internet phone service. 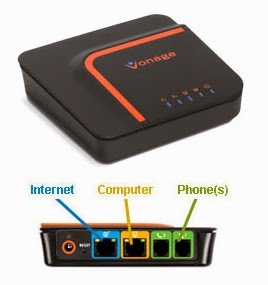 You attach the Vonage Box to your modem or router, plug your phone cord into it as well and you're all set. It makes and receives calls just like like a landline phone service but it uses your high speed internet connection instead of a phone line. Vonage boxes can be ordered and sent to 34 different countries. If you are military, they’ll gladly send your box to an APO/FPO address. Once you start your service, you get a stateside phone number. Then friends and family can call you anytime and it’s just like you are still in the States. When you PCS, take your Vonage box with you and your number stays the same. The box can also be taken along on deployments. As long as you have an internet connection and a touchtone phone, you are good. This just gives you one less thing to worry about when PCS season rolls around. Vonage is also making sure you never miss another call by extending the reach of the phone, straight to your cell phone. They even now have an app available for smartphones. The app allows you to make calls from you cell for the same low price, while still using your Vonage number. This is perfect if you are stationed overseas! There are definitely other options out there. Most of us have used Skype, and there's Google Chat. If you have an Iphone you've got facetime. There are also other internet compatible phone services out there like MagicJack. What they don't have is the reliability and customer service. Granted you might not be able to see each other’s faces like on some of the other products I mentioned; but sometimes a simple and reliable phone call is exactly what you need to breathe a sigh of relief. We’ve used MagicJack while my husband was deployed to Iraq and then continued to use it when we moved to rural New York as a house phone, BUT I can say that MagicJack has a very static connection and not always reliable. It cuts out too. Plus I’ve also used Google Chat with multiple people being connected and it’s still needs more development. You can’t all talk at the same time and if you do you don’t hear what the other person is saying. Also with Google Chat your video freezes, sound gets distorted and lines dropped. When you have that precious time with your service member, you want to actually hear your loved one! Thinking that Vonage would be a wonderful asset to your family? Follow along for a giveaway over the next few weeks where you will have a chance to win a Vonage Box and 12 months of service to get you connecting with your loved ones again! Disclaimer: This is a sponsored post. I’ve been provided a free Vonage Box and 12 months of free Vonage service in exchange for this and future Vonage posts.